Fightback Canada - Hands off Rosa Luxemburg! The following article from 1932 is a short but impassioned defence of the legacy of the German revolutionary Rosa Luxemburg, murdered 100 years ago in the cause of working class liberation. The article, authored by Leon Trotsky, skillfully refutes the slanders made by Josef Stalin against Luxemburg in a 1931 article—slanders which include her not being a revolutionary. In particular, repeated attempts were made by Stalin to drive a wedge between Lenin and Luxemburg. While certain disagreements did exist between these two figures (and these are by no means unimportant), Luxemburg stood firmly in the camp of Bolshevism after 1917, and this was recognized by practically everyone at the time. More importantly, Lenin later admitted that Luxemburg was correct in her suspicion of the leaders of German Social Democracy, in particular Karl Kautsky, at a time when he himself had serious illusions in them. The bankruptcy of these misleaders only became evident in 1914 as they voted for the First World War, much to Lenin’s surprise. Trotsky relays this history in his article, against the systematic falsifications of Stalin. 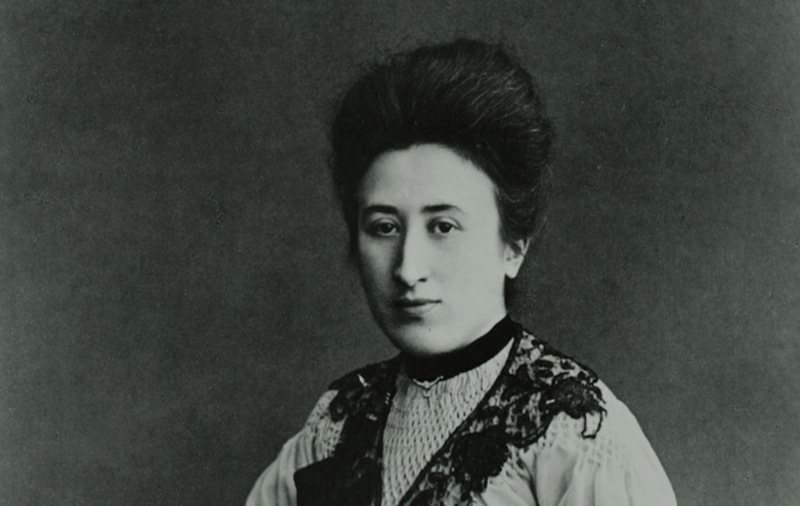 Luxemburg alone understood how deeply opportunism had penetrated the German Social Democracy, and this is perhaps the greatest testament to her revolutionary instinct. To put forward such an assertion, one must be absolutely ignorant of the history of one’s own party, and first of all, of Lenin’s ideological course. There is not a single word of truth in Stalin’s point of departure. In 1903–04, Lenin was, indeed, an irreconcilable foe of opportunism in the German Social Democracy. But he considered as opportunism only the revisionist tendency which was led theoretically by Bernstein. Kautsky at the time was to be found fighting against Bernstein. Lenin considered Kautsky as his teacher and stressed this everywhere he could. In Lenin’s work of that period and for a number of years following, one does not find even a trace of criticism in principle directed against the Bebel-Kautsky tendency. Instead one finds a series of declarations to the effect that Bolshevism is not some sort of an independent tendency but is only a translation into the language of Russian conditions of the tendency of Bebel-Kautsky. Here is what Lenin wrote in his famous pamphlet, Two Tactics, in the middle of 1905: “When and where did I ever call the revolutionism of Bebel and Kautsky ‘opportunism?’ . . . When and where have there been brought to light differences between me, on the one hand, and Bebel and Kautsky on the other? . . . The complete unanimity of international revolutionary Social Democracy on all major questions of program and tactics is a most incontrovertible fact” [Collected Works, Volume 9, July 1905]. Lenin’s words are so clear, precise, and categorical as to entirely exhaust the question. A year and a half later, on December 7, 1906, Lenin wrote in the article The Crisis of Menshevism: “. . . from the beginning we declared (see One Step Forward, Two Steps Back): We are not creating a special ‘Bolshevik’ tendency; always and everywhere we merely uphold the point of view of revolutionary Social Democracy. And right up to the social revolution there will inevitably always be an opportunist wing and a revolutionary wing of Social Democracy” [ibid., Volume 11, December 7, 1906]. Two weeks later, on December 20, 1906, Lenin greeted enthusiastically Kautsky’s answer to Plekhanov’s questionnaire on the character of the Russian revolution: “He has fully confirmed our contention that we are defending the position of revolutionary Social Democracy against opportunism, and not creating any ‘peculiar’ Bolshevik tendency . . .” [The Proletariat and Its Ally in the Russian Revolution, ibid., Volume 11, December 10, 1906]. Within these limits, I trust, the question is absolutely clear. According to Stalin, Lenin, even from 1903, had demanded a break in Germany with the opportunists, not only of the right wing (Bernstein) but also of the left (Kautsky). Whereas in December 1906, Lenin as we see was proudly pointing out to Plekhanov and the Mensheviks that the tendency of Kautsky in Germany and the tendency of Bolshevism in Russia were—identical. Such is part one of Stalin’s excursion into the ideological history of Bolshevism. Our investigator’s scrupulousness and his knowledge rest on the same plane! Directly after his assertion regarding 1903–04, Stalin makes a leap to 1916 and refers to Lenin’s sharp criticism of the war pamphlet by Junius, i.e., Rosa Luxemburg. To be sure, in that period Lenin had already declared war to the finish against Kautskyism, having drawn from his criticism all the necessary organizational conclusions. It is not to be denied that Rosa Luxemburg did not pose the question of the struggle against centrism with the requisite completeness – in this Lenin’s position was entirely superior. But between October 1916, when Lenin wrote about the Junius pamphlet, and 1903, when Bolshevism had its inception, there is a lapse of thirteen years; in the course of the major part of this period Rosa Luxemburg was to be found in opposition to the Kautsky and Bebel Central Committee, and her fight against the formal, pedantic, and rotten-at-the-core “radicalism” of Kautsky took on an ever increasingly sharp character. On October 27, 1914, Lenin wrote to A. Shlyapnikov: “I hate and despise Kautsky now more than anyone, with his vile, dirty, self-satisfied hypocrisy . . . Rosa Luxemburg was right when she wrote, long ago, that Kautsky has the ‘subservience of a theoretician’—servility, in plainer language, servility to the majority of the party, to opportunism” (Leninist Anthology, Volume 2, p.200, my emphasis) [ibid., Volume 35, October 27, 1914]. Were there no other documents—and there are hundreds – these few lines alone could unmistakably clarify the history of the question. Lenin deemed it necessary at the end of 1914 to inform one of his colleagues closest to him at the time that “now,” at the present moment, today, in contradistinction to the past, he “hates and despises” Kautsky. The sharpness of the phrase is an unmistakable: indication of the extent to which Kautsky betrayed Lenin’s hopes and expectations. No less vivid is the second phrase, “Rosa Luxemburg was right when she wrote, long ago, that Kautsky has the ‘subservience of a theoretician.’ . . .” Lenin hastens here to recognize that “verity” which he did not see formerly, or which, at least, he did not recognize fully on Rosa Luxemburg’s side. In Rosa Luxemburg’s struggle against Kautsky, especially in 1910–14, an important place was occupied by the questions of war, militarism, and pacifism. Kautsky defended the reformist program: limitations of armaments, international court, etc. Rosa Luxemburg fought decisively against this program as illusory. On this question Lenin was in some doubt, but at a certain period he stood closer to Kautsky than to Rosa Luxemburg. From conversations at the time with Lenin I recall that the following argument of Kautsky made a great impression upon him: just as in domestic questions, reforms are products of the revolutionary class struggle, so in international relationships it is possible to fight for and to gain certain guarantees (“reforms”) by means of the international class struggle. Lenin considered it entirely possible to support this position of Kautsky, provided that he, after the polemic with Rosa Luxemburg, turned upon the right-wingers (Noske and Co.). I do not undertake now to say from memory to what extent this circle of ideas found its expression in Lenin’s articles; the question would require a particularly careful analysis. Neither can I take upon myself to assert from memory how soon Lenin’s doubts on this question were settled. In any case they found their expression not only in conversations but also in correspondence. One of these letters is in the possession of Karl Radek. I deem it necessary to supply on this question evidence as a witness in order to attempt in this manner to save an exceptionally valuable document for the theoretical biography of Lenin. In the autumn of 1926, at the time of our collective work over the platform of the Left Opposition, Radek showed Kamenev, Zinoviev, and me—probably also other comrades as well—a letter of Lenin to him (1911?) which consisted of a defense of Kautsky’s position against the criticism of the German Lefts. In accordance with the regulation passed by the Central Committee, Radek, like all others, should have delivered this letter to the Lenin Institute. But fearful lest it be hidden, if not destroyed, in the Stalinist factory of fabrications, Radek decided to preserve the letter till some more opportune time. One cannot deny that there was some foundation to Radek’s attitude. At present, however, Radek himself has—though not very responsible—still quite an active part in the work of producing political forgeries. Suffice it to recall that Radek, who in distinction to Stalin is acquainted with the history of Marxism, and who, at any rate, knows this letter of Lenin, found it possible to make a public statement of his solidarity with the insolent evaluation placed by Stalin on Rosa Luxemburg. The circumstance that Radek acted thereupon under Yaroslavsky’s rod does not mitigate his guilt, for only despicable slaves can renounce the principles of Marxism in the name of the principles of the rod. When Lenin, going back into the past, wrote in October 1919 (Greetings to Italian, French, and German Communists) that “. . . at the moment of taking power and establishing the Soviet republic, Bolshevism was united; it drew to itself all that was best in the tendencies of socialist thought akin to it ...” [ibid., Volume 30, October 10, 1919], I repeat, when Lenin wrote this he unquestionably had in mind also the tendency of Rosa Luxemburg, whose closest adherents, e.g., Marchlewsky, Dzerzhinsky, and others went working in the ranks of the Bolsheviks. In his article A Contribution to the History of the Question of the Dictatorship (October 1920), Lenin, touching upon questions of the Soviet state and the dictatorship of the proletariat already posed by the 1905 revolution, wrote: “While such outstanding representatives of the revolutionary proletariat and of unfalsified Marxism as Rosa Luxemburg immediately realized the significance of this practical experience and made a critical analysis of it at meetings and in the press,” on the contrary, “. . . people of the type of the future ‘Kautskyites’ . . . proved absolutely incapable of grasping the significance of this experience . . .” [ibid., Volume 31, October 20, 1920]. In a few lines, Lenin fully pays the tribute of recognition to the historical significance of Rosa Luxemburg’s struggle against Kautsky – a struggle which Lenin himself had been far from immediately evaluating at its true worth. If to Stalin, the ally of Chiang Kai-shek, and the comrade-in-arms of Purcell, the theoretician of “the worker-peasant party,” of “the democratic dictatorship,” of “non-antagonizing the bourgeoisie,” etc.—if to him Rosa Luxemburg is the representative of centrism, to Lenin she is the representative of “unfalsified Marxism.” What this designation meant coming as it does from Lenin’s pen is clear to anyone who is even slightly acquainted with Lenin. Of course the author of these notes will in all probability tomorrow confess his sins and announce that in Lenin’s epoch he wrote in a benighted condition, and that he reached complete enlightenment only in the epoch of Stalin. At the present moment announcements of this sort—combinations of sycophancy, idiocy, and buffoonery—are made daily in the Moscow press. But they do not change the nature of things: What’s once set down in black and white, no ax will hack nor all your might. Yes, Rosa Luxemburg has become the banner of the proletarian revolution! How and wherefore, however, did Stalin suddenly busy himself—at so belated a time—with the revision of the old Bolshevik evaluation of Rosa Luxemburg? As was the case with all his preceding theoretical abortions so with this latest one, and the most scandalous, the origin lies in the logic of his struggle against the theory of permanent revolution. In this “historical” article, Stalin once again allots the chief place to this theory. There is not a single new word in what he says. I have long ago answered all his arguments in my book The Permanent Revolution. From the historical viewpoint the question will be sufficiently clarified, I trust, in the second volume of The History of the Russian Revolution (The October Revolution), now on the press. In the present case the question of the permanent revolution concerns us only insofar as Stalin links it up with Rosa Luxemburg’s name. We shall presently see how the hapless theoretician has contrived to set up a murderous trap for himself. After recapitulating the controversy between the Mensheviks and the Bolsheviks on the question of the motive forces of the Russian revolution and after masterfully compressing a series of mistakes into a few lines, which I am compelled to leave without an examination, Stalin writes: “What was the attitude of the German Left Social Democrats, of Parvus and Rosa Luxemburg, to this controversy? They invented a utopian and semi-Menshevik scheme of permanent revolution . . . Subsequently, this semi-Menshevik scheme of permanent revolution was seized upon by Trotsky (in part by Martov) and turned into a weapon of struggle against Leninism.” Such is the unexpected history of the origin of the theory of the permanent revolution, in accordance with the latest historical researches of Stalin. But, alas, the investigator forgot to consult his own previous learned works. In 1925 this same Stalin had already expressed himself on this question in his polemic against Radek. Here is what he wrote then: “It is not true that the theory of the permanent revolution . . . was put forward in 1905 by Rosa Luxemburg and Trotsky. As a matter of fact this theory was put forward by Parvus and Trotsky.” This assertion may be consulted on page 185, Problems of Leninism, Russian edition, 1926. Let us hope that it obtains in all foreign editions. So, in 1925, Stalin pronounced Rosa Luxemburg not guilty in the commission of such a cardinal sin as participating in the creation of the theory of the permanent revolution. “As a matter of fact, this theory was put forward by Parvus and Trotsky.” In 1931, we are informed by the identical Stalin that it was precisely “Parvus and Rosa Luxemburg . . . who invented a Utopian and semi-Menshevik scheme of permanent revolution.” As for Trotsky he was innocent of creating the theory, it was only “seized upon” by him, and at the same time by . . . Martov! Once again Stalin is caught with the goods. Perhaps he writes on questions of which he can make neither head nor tail. Or is he consciously shuffling marked cards in playing with the basic questions of Marxism? It is incorrect to pose this question as an alternative. As a matter of fact, both the one and the other are true. The Stalinist falsifications are conscious insofar as they are dictated at each given moment by entirely concrete personal interests. At the same time they are semi-conscious, insofar as his congenital ignorance places no impediments whatsoever to his theoretical propensities. What is truly fatal is that there is not a single major question of the international proletarian revolution on which Stalin has failed to express two directly contradictory opinions. We all know that in April 1924, he conclusively demonstrated in Problems of Leninism the impossibility of building socialism in one country. In autumn, in a new edition of the book, he substituted in its place a proof—i.e., a bald proclamation—that the proletariat “can and must” build socialism in one country. The entire remainder of the text was left unchanged. On the question of the worker-peasant party, of the Brest-Litovsk negotiations, the leadership of the October Revolution, on the national question, etc., etc., Stalin contrived to put forward, for a period of a few years, sometimes of a few months, opinions that were mutually exclusive. It would be incorrect to place the blame in everything on a poor memory. The matter reaches deeper here. Stalin completely lacks any method of scientific thinking, he has no criteria of principles. He approaches every question as if that question were born only today and stood apart from all other questions. Stalin contributes his judgments entirely depending upon whatever personal interest of his is uppermost and most urgent today. The contradictions that convict him are the direct vengeance for his vulgar empiricism. Rosa Luxemburg does not appear to him in the perspective of the German, Polish, and international workers’ movement of the last half-century. No, she is to him each time a new, and, besides, an isolated figure, regarding whom he is compelled in every new situation to ask himself anew, “Who goes there, friend or foe?” Unerring instinct has this time whispered to the theoretician of socialism in one country that the shade of Rosa Luxemburg is irreconcilably inimical to him. But this does not hinder the great shade from remaining the banner of the international proletarian revolution.